The striker is pictured distraught after his penalty miss against Croatia. 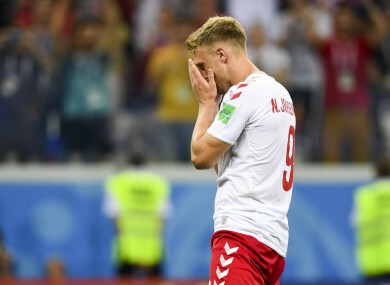 THE DANISH FOOTBALL Association has filed a police complaint after death threats were sent to Nicolai Jorgensen in the wake of their exit from the World Cup. Denmark were knocked out of the tournament by Croatia in a penalty shoot-out after Ivan Rakitić scored the decisive kick as a result of a Jorgensen miss. After seeing Christian Eriksen and Lasse Schone’s attempts from the spot saved, the Feyenoord striker missed his side’s fifth and final penalty. Despite heroics from Kasper Schmeichel throughout the shoot-out, Rakitić’s effort was enough to send the Croatians through. The failure in Russia has been hard for some supporters to take and many have attacked the striker on social media with death threats and homophobic slurs. In a statement on Tuesday morning, the Danish FA has called for the abuse to stop and announced that they will follow the issue up with the authorities. STOP. Our society must never accept death threats – not against World Cup stars, politicians or anyone else,” the governing body said. Jorgensen featured in the first two matches of the World Cup as Denmark beat Peru and drew with Australia, but was rested for the clash with France. He came off the bench in the second-half against Croatia. Email “Denmark striker Jorgensen receives death threats after World Cup penalty miss ”. Feedback on “Denmark striker Jorgensen receives death threats after World Cup penalty miss ”.